Making the choice between interactive projectors and flat screens can be a daunting task. Here’s what you need to know to make the best decision. Enhance your students’ learning experience with dynamic, user-friendly imaging technology from Epson. Is your school looking to make its next move with display technology? Maybe your interactive whiteboards are getting older or collecting dust. The good news is, display technology has come a long way since the heyday of whiteboards. Now the race is on between interactive projectors and flat screens, both of which have more meaningful potential when it comes to learning and instruction. The big benefit of projectors is the adjustable display size. According to Radius Research, 58% of students can’t read content on a 70” flat panel. 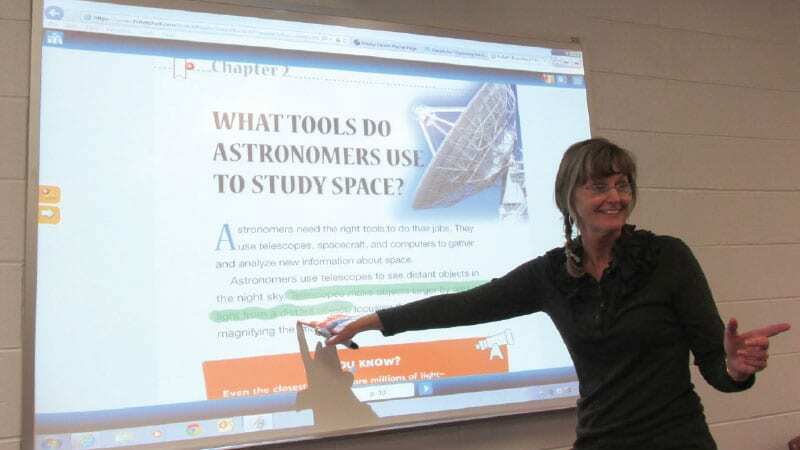 Using interactive projectors, teachers can project a large image (as much as 100 inches) onto the wall that can be easily viewed by all students in the classroom. Some schools are even using two projectors side by side to create a super-sized display of interactive content—annotating a teacher model of an essay on one side, for example, and a student essay on the other. When teachers layer slide decks, tap into resources from the web, and have kids get out of their seats to work at the board, it’s more engaging. Also, teachers can make notes and annotate as they lecture, saving the material online to share with students who were absent or want to review the material at home. Most interactive projectors also offer the ability to interact with student devices, so that students can work on problems or questions from their own Chromebooks, PCs, or Apple products. The teacher can then select an individual student’s screen to share via the main projector, allowing for immediate feedback. Depending on how an interactive projector is mounted, yo u can display images on different walls—or even the table or floor. This gives teachers flexibility with lessons. They might project a map of Europe on a table, for example, and have students plot their capitols and major cities. We’ve even seen teachers project a virtual fire in their reading nooks to create a cozier reading experience! Miguel Guhlin, Director of Professional Development at Texas Computer Education Association in Austin, Texas, suggests getting a map of every classroom and meeting with individual teachers to figure out the best mounting location. You might even test a location for a few weeks before permanently mounting to make sure it works for the educator. The cost of interactive projectors varies, but start at around $1,500 compared to $3,500 for interactive flat panel displays. Projector lamps may need to be replaced periodically, depending how much they are used. However, lamp technology has come a long way. The latest projector lamps can last up to 12,000 hours and cost as little as $49 to replace. Judd says the secret is to have lamps in stock so teachers don’t use instructional time to replace the lamps when they go out. Judd also suggests training staff to do preventative maintenance, including cleaning the units and swapping out filters. There is also a new class of projector on the market that replaces the lamp with a high tech laser and does not require maintenance. The laser lasts up to 20,000 hours. For schools that are concerned about maintenance, laser projection is a good option. Like interactive projectors, flat screens offer opportunities for interactivity and collaboration. Also, like projectors, most flat screens offer the ability for students to interact with the content through their own remote device, such as a tablet or a laptop. Flat-screen televisions are a fixed size (typically a 70-inch display) and cannot be enlarged like an image from a projector. In a larger classroom, it can be difficult for some students to read the screen from the back. Also, depending on the size and acoustics of the classroom, sound can be an issue with flat screens, says Kim Harrison, chief technology officer at Washington Unified School District in Sacramento, California. Upkeep is pretty simple. Some schools like that the long-term maintenance costs are low. Installing a TV can also be easier than mounting a projector, though the cost of mounting hardware for a panel can exceed that of a projector. All in all, the long-term maintenance cost of laser projection is comparable to that of a flat panel. Flat-screen TVs can be vulnerable to theft. This is especially true when they aren’t mounted, says Harrison. Special theft prevention measures should be taken for safe storage of the equipment. P.S. Here’s a link to learn more about the interactive projector options available from Epson, if you’re curious. We hear great things from educators who are using them in their schools.